Juneau the road to Sitka? Of course Judon’t. There’s not one. We arrived at Sitka in the rain. We set up camp next to the harbor in a veritable parking lot from which people were firing rifles into the sound. We drove into town. There’s an interesting National Park installation in town where a trail leads you through a dozen totems. These totems are all under 100 years old, but they’re still interesting. a number of people standing on the bridge looking at the water. “Salmon,” I speculated. At first glance, I saw no fish, but upon closer inspection saw two, three, maybe four or five fish. Then I looked again. 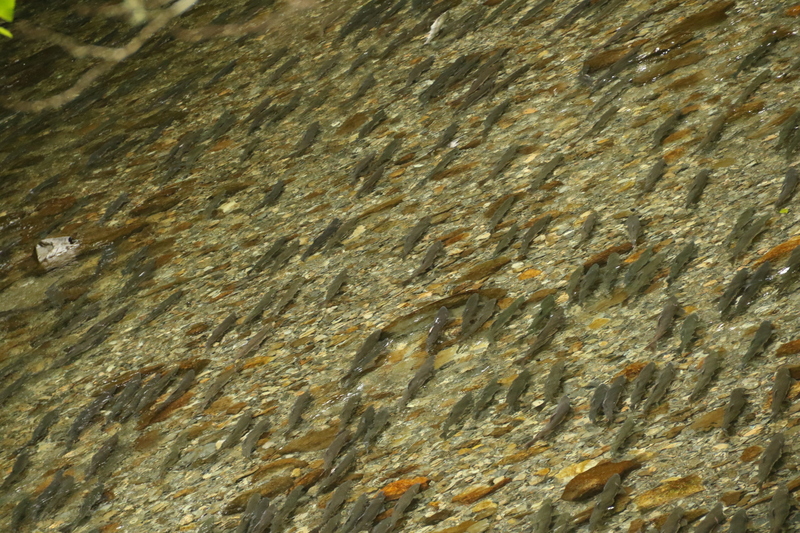 The river was alive with salmon (dying salmon). Hundreds of them. As numerous as pebbles. It was an unreal sight. They were almost all of them just hovering in the water; it turned out they were swimming at the same speed as the current against which they were heading, so they weren’t moving. The brewery was not a brewpub; they just served their beer, which was just as good as any. All beer in the Pacific northwest tastes good. We walked around town, which was mostly closed since it was a Sunday night. We observed the Russian onion-domed church which was closed. We window-shopped several nice little stores. 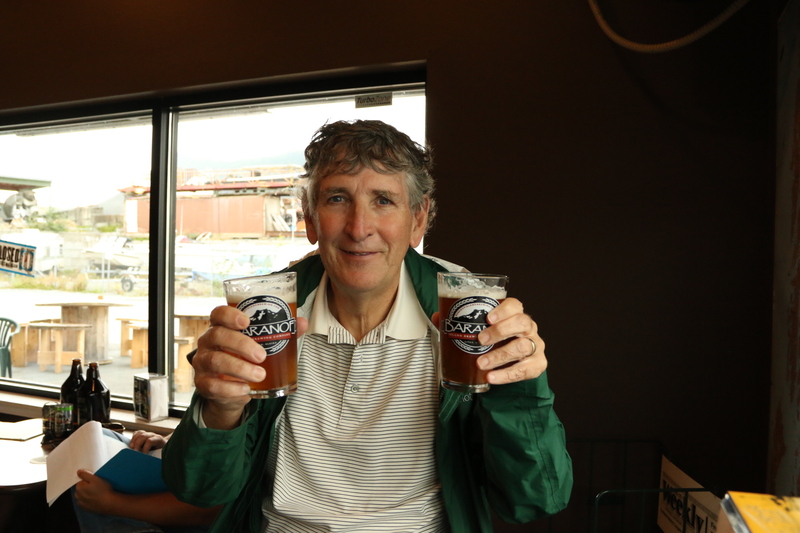 I should mention we also attended the Alasksn Brewery in Juneau, which also did not serve food, but they gave free samples. They brew several outstanding IPA’s. 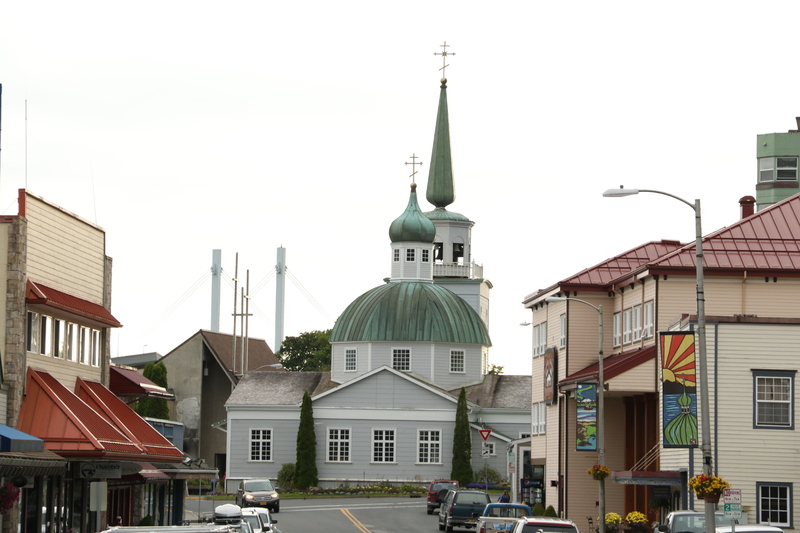 Sitka was the main Russian city in Alaska before the Russians forced the U.S. to take it. You can learn plenty about the town in Michener’s “Alaska.” We climbed a hill that overlooks the city, where the Russian flag was lowered and the American flag raised when the territory changed hands. It’s also where the first 49-star Stars and Stripes was raised. The hill has other significance in the Russian period for both residential and tactical reasons (read the book). Before shipping out on the ferry the next day we did some real shopping, and it was very pleasant and rewarding. We were told that Sitka, once a major stop on the cruise ship lines, is now being bypassed. Mendenhall glacier in the rain. The trip to Juneau, as previously reported, was fast and uneventful. We arrived at Juneau in the rain. It rained for two days, but the forecast for Thursday (Johnnie Morris’ birthday) was for sun, so we delayed our departure for Haines by a day. 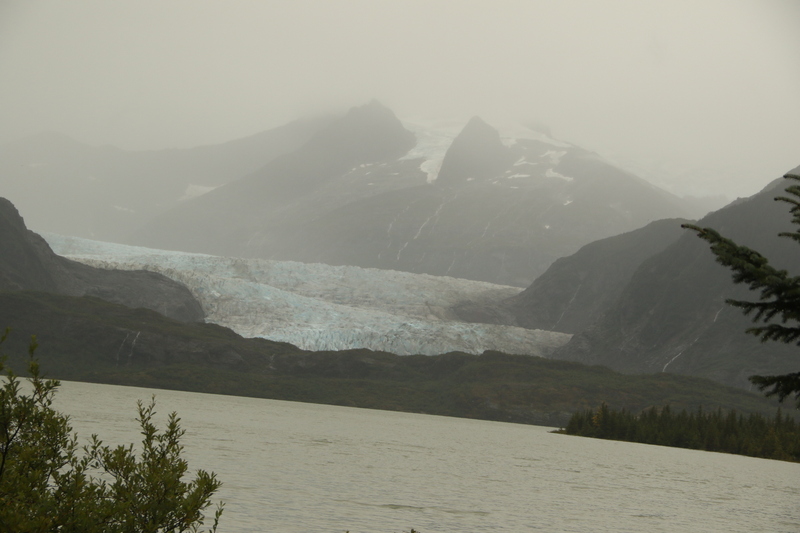 While it was raining, we went to the Mendenhall Glacier, which is very impressive. We took a couple of short hikes to amazing views. It turns out, when it’s clear, the glacier is even more impressive, as well as the surrounding mountains. 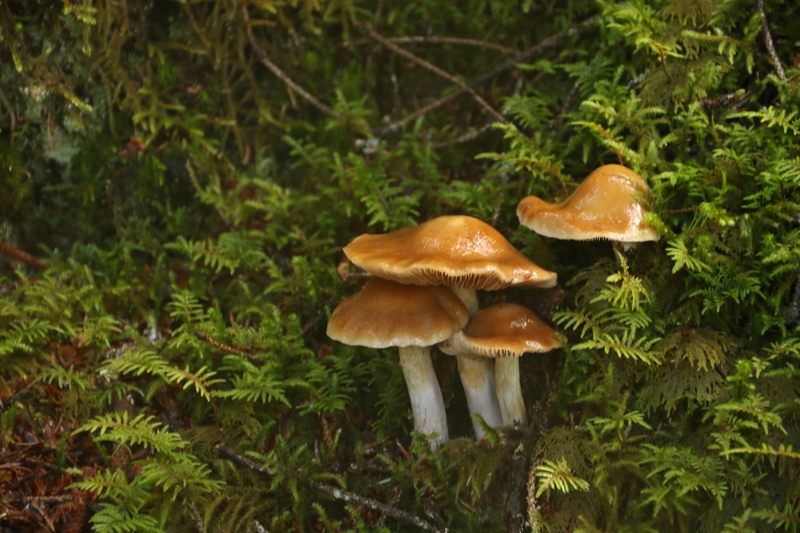 It dominates the landscape all around the Auke Bay section of Juneau. 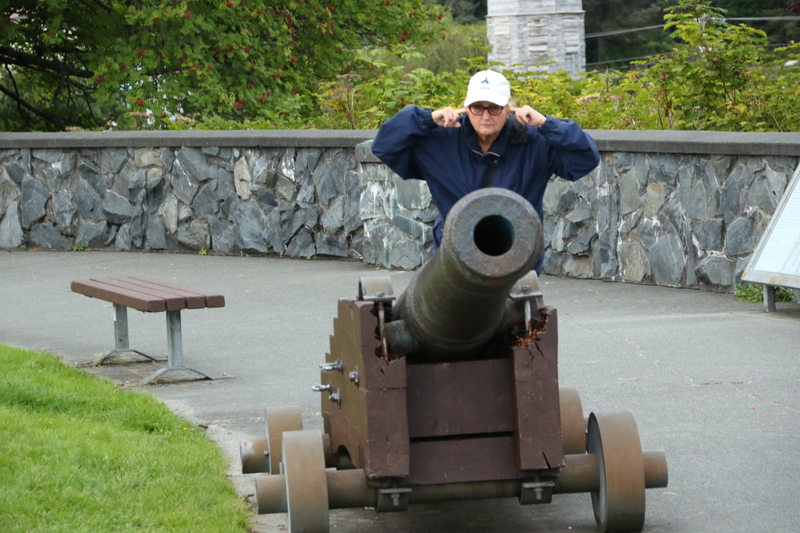 We went to downtown Juneau. There were four cruise ships lined up in the harbor. There were dozens of jewelry shops lining the road next to the cruise ships. The Alaska knickknack shops were all a couple of blocks closer to the city center. 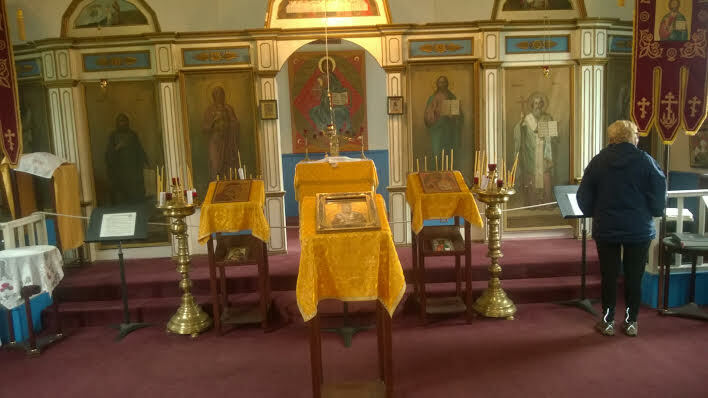 We found an onion-dome church, St. Nicholas’, which we were allowed to enter. It’s the oldest continuously-operating parish in town, and has a number of Tinglits among its current membership. We also had some really good Russian dumplings, to continue with the Russian motif. The other thing we did in the rain was to hide out in the Wegwam. 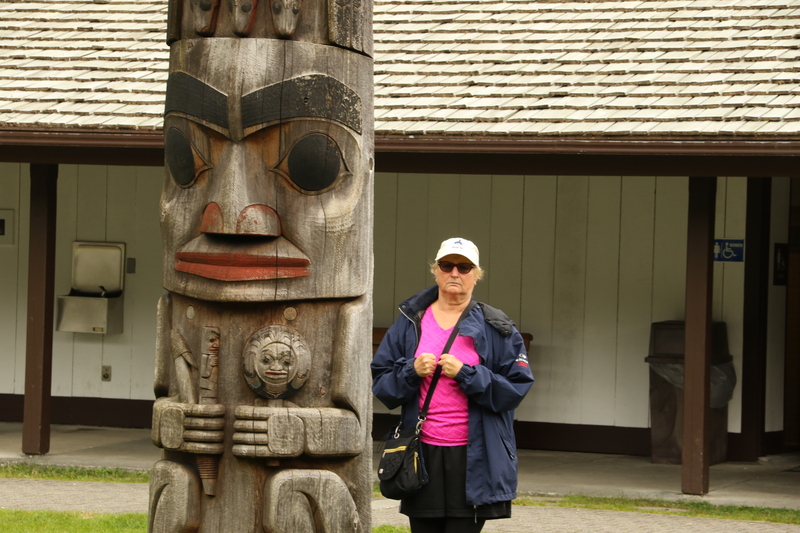 We were camped in the Mendenhall Lake Campground, a U.S. Forestry Service campground. When we arrived (in the rain) we found our reserved site, and since there were only four campers in the 19 RV spots, we asked if we could move. The only way to switch sites was to cancel our reservation, at a cost of one night’s rent plus $10, and reserve a different site. We decided to stay where we were. Care to fungus a few? It turns out, it’s maybe the nicest campground in North America. For one thing, it handles rain really well (better than we did, but that’s coming up shortly). The sites are all wooded, and well separated from each other. 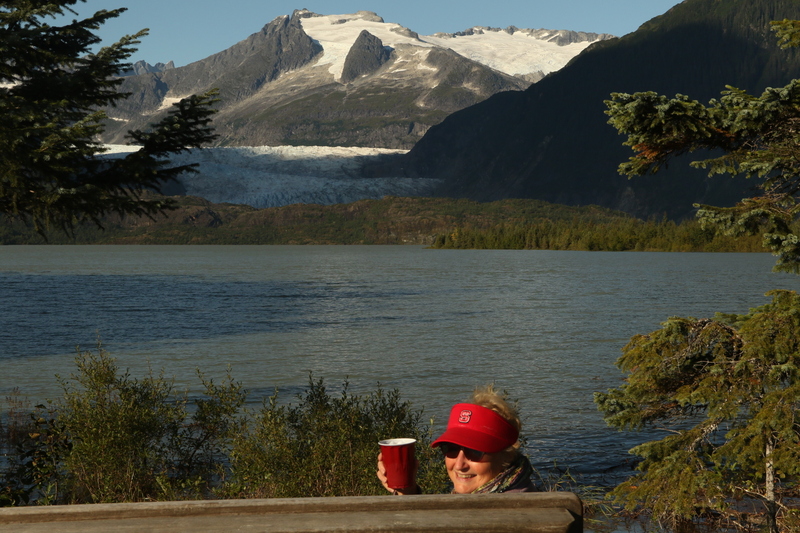 And there’s a fantastic view of the glacier from the campground; a view that is compounded when the sun shines. 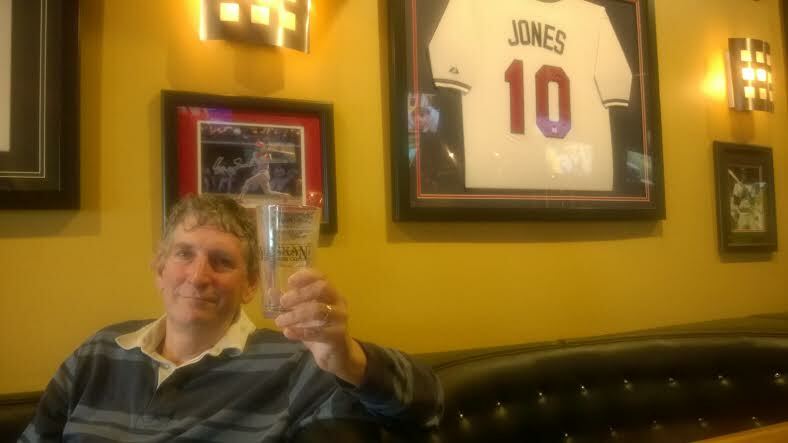 We went into a bar next door to where we were doing laundry, McGivney’s or something like that, and realized we were sitting beneath an autographed Chipper Jones jersey. We walked one of the short campground trails, among trees and small ponds, and saw a beaver swimming at close hand. A mother and her children happened upon the scene. Suddenly the beaver raised its tail above the water and slapped it down with a big “Slap!” sound, then dove. None of us had ever seen such a thing. In the sunshine on our final day in Juneau, we hiked both the East and West Glacier trails. 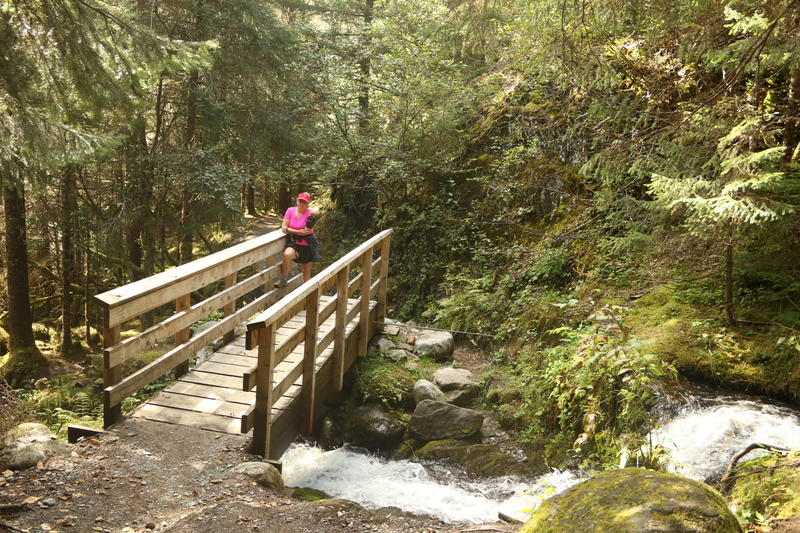 The east trail, which leaves from the visitors’ center, loops a rugged three miles with a 500-foot elevation increase. The trouble is, the glacier has retreated so far you can’t see it from the viewpoint. 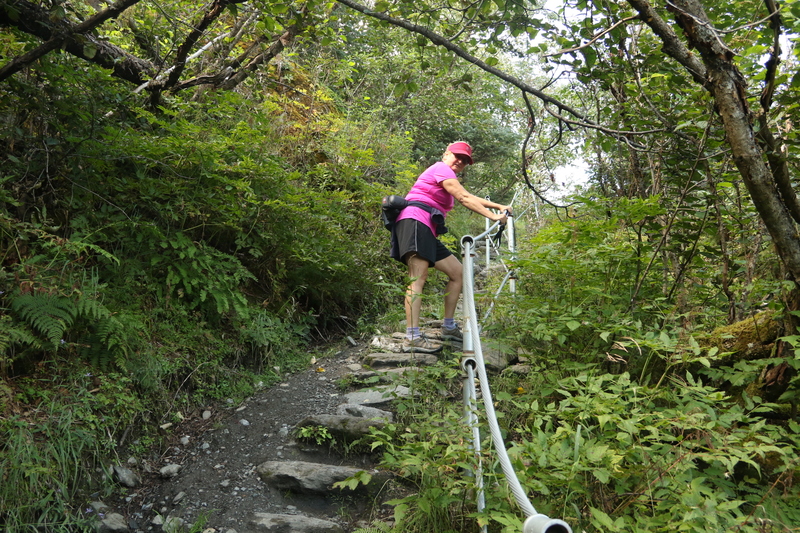 The west trail, in contrast, hovers right over the tongue of the glacier and gives you a view of the ice field that feeds the glacier, as well as several glacier-clad mountains, and another glacier (Lemon?) off to the east. So about my mishandling of the rain. We put out our awning so we’d have a dry spot next to the door. I went out during the night and noticed rain had accumulated in the awning instead of running off to the side, so we had two large sags of water. I pushed up on one of the bulges the release the water, which unfortunately upset the delicate equilibrium. One of the corner poles gave way, the awning fell toward the ground in a whoosh, and the center support crossbar bent in half. We were lucky (Rebecca was awakened by the clatter and rose from her bed to see what was the matter) to be able to roll the wounded awning back into its holder, so we are able to drive. But we will be ferrying to Haines, and driving to points beyond, without an awning. However, the trip looks relatively full even without that.